The Northeastern Wabanaki groups (Penobscot, Abenaki, Passamaquoddy, Maliseet and Micmac Nations) of Vermont, Maine and Eastern Canada had a history of serving as guides for non-indigineous hunters who wished to explore the region’s rivers and lakes. To service the needs of these travellers, they created drinking cups that they crafted or had crafted in centers of trade. 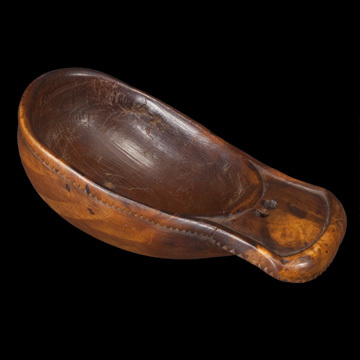 Called “canoe” or “belt” cups, these items were crafted from hardwoods and burls and often were embellished with sporting motifs. This example is carved from maple and has a jagged border carved along its edge-the whole, when turned upside down, seems to represent a duck’s head and bill.